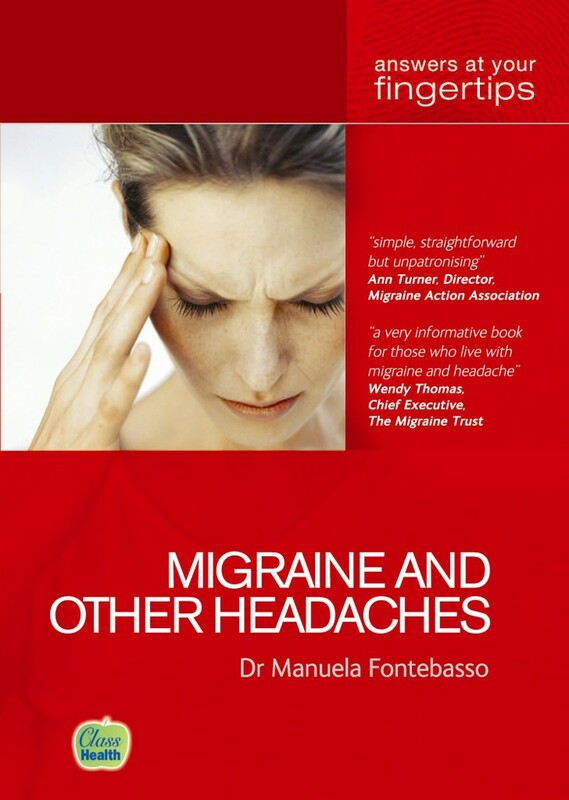 Migraine Monologues: Book Review: Migraine and Other Headaches by Dr Fontebasso. Guest Post. 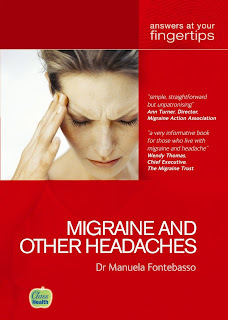 Book Review: Migraine and Other Headaches by Dr Fontebasso. Guest Post. 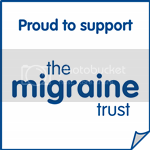 The fabulous Daisy, of Migraine Memoirs, was the obvious choice to review this handy guide to migraines. Why? Because Daisy happens to be a patient of Dr Fontebasso who heads up (excuse the pun) the York Headache Clinic. Who better to compare the book (the theory) to the actual treatment (practise) and care given. Daisy's review makes for interesting (and very honest) reading - and, I must confess - I completely agree with her analysis. But you'll have to read on below to find out what that is! 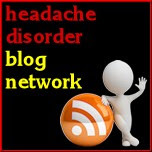 To discuss the book, and general migraine issues, with the rest of the Book Club Members join us tomorrow (Tuesday 8th) for a private, on-line, group discussion. Directions at the bottom of this post. I was excited when Victoria asked me to do the review for the book club this time, mostly because the book is written by my specialist at York Hospital and I could draw comparisons on my experience at the Headache Clinic at York Hospital’s Department of Neurology with the book. Firstly, a note about the way the Headache Clinic works at York Hospital for migraine sufferers like myself. On my first visit I had a 30 minute appointment with Dr Fontebasso, the book's author, who then provided my diagnosis of Migraine Without Aura. After that, I return every 6 months but each visit after the first one is with the specialist nurse, Jill Murphy, who I noticed was mentioned in the acknowledgements in the book, so I have had minimal contact with Dr Fontebasso despite the fact she is my specialist doctor. 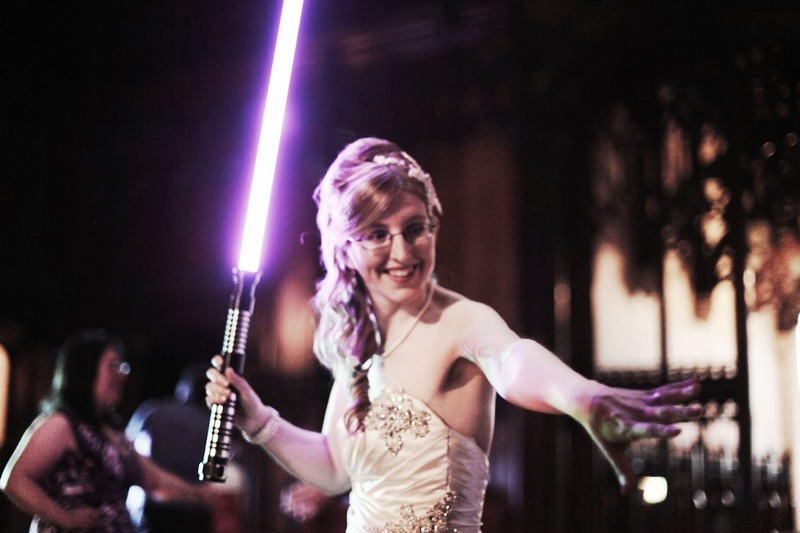 The fabulous Daisy on her wedding day! The book itself is broken down into various chapters which range from defining migraine and other headaches, diet & lifestyle and other complementary therapies, through to both preventative and acute treatments. I think the chapter subjects themselves were well thought out, covering a wide area of topics. The format of almost all of those chapters however, is a brief introduction to the topic by Dr Fontebasso followed by the rest of the chapter being questions and answers. Judging by the specific situational nature of many of the questions, I believe the questions are largely asked by real people. Unfortunately, the result of this format structure is that the questions and answers are extremely repetitive and you have to read through lots of almost identical answers to find the occasional new piece of information or advice. This was a really tedious way to find out the information Dr Fontebasso was trying to convey to us, and left me feeling really frustrated. Even more frustrating I found, was that there were even some questions which we repeated verbatim in other chapters. Leaving the frustrating formatting of the book aside, I was naturally comparing my experiences at the Headache Clinic at York Hospital as I read it. The introduction I thought was very good, recognising that every person is different and that you need to understand a person's full story to understand their headaches or migraines the best. This was reflected by the full and thorough history Dr Fontebasso took from me on my first visit at the hospital and I hope this was all passed along to the specialist nurse who I have been seeing ever since, as this was never something she asked for. In the introduction Dr Fontebasso describes the format of the book as being designed to best empower the reader to find out and understand their own problems as best they could, but I think the same information would have been much better disseminated in a different format. I found it interesting (on page 14) in the chapter about what migraine is, that Dr Fontebasso doesn't recommend detailed diaries are kept, as this focusses too much on the negative. I strongly disagree with this as I think a detailed diary helps each person to understand what their triggers are so that they can better manage them in the future. From my experience at York Hospital, the specialist nurse has asked me to keep diaries for just this reason so I found this contradictory from my experience at Dr Fontebasso's clinic as well. In chapter five, which was about headaches with more serious consequences, I really felt the information here would have been far better laid out. For example, having the possible symptoms of these more serious conditions, and information about them, which would make it an easy reference chapter compared to (again) very piecemeal way of having to look through all of the questions and answers. Chapter seven which was focussed on successfully managing your condition and how to best help yourself was, I think, one of the most useful chapters in the book. The descriptions of thresholds and managing thresholds is exactly what I have had described to me at York hospital and I found that way of thinking a revolution with regards to managing my lifestyle - and I'm really pleased it has been described in the book. Considering that I have been given several self-printed leaflets at the clinic, I'm surprised that I was never given a leaflet showing the threshold diagrams on pages 84 & 86. The information about the glycaemic index on pages 95 and 96 was very useful and I was surprised that I have never been told about this at York hospital. The information about complementary therapies in chapter eight was certainly backed up by the actions taken at York hospital as they referred me to NHS provided specialist headache acupuncture and a headache specialist clinical psychologist. In chapter nine which is about who you can go to for help with headaches and migraines, the introduction mentioned a specialist nurse, which is of course how the York hospital clinic works. I find this way of working very frustrating though as I would also like the opportunity to see Dr Fontebasso again as well, as good as Jill Murphy is I don't expect her to have the same level of understanding of things that Dr Fontebasso has. Chapters eleven and twelve deal with acute and preventative treatments and when discussing various drugs, I very strongly feel that this information would be better presented if it was laid out in a clear and structured way - instead of the usual question and answer format. The table of drug interactions on pages 180 and 181 was very helpful but I'm surprised again, that I haven't been given this information by York hospital. In chapter twelve, Dr Fontebasso explains how preventatives should only be taken for three to twelve months to break a cycle, but I have been on propranalol for three years now so I'm surprised that I haven't been advised to come off it by now if this is her recommendation. I was pleased to see that a whole chapter was dedicated to medication overuse headache (MOH) as I think this is very common among chronic migraine sufferers and it's something which GPs don't seem to have much understanding of. I had MOH when I had my first visit to the clinic at York hospital and since then I have been limited by them to only six medication days per rolling month. This has been very difficult to stick to but I have stuck to it having experienced MOH I don't want to go through that again. I found chapter fifteen about women and hormones particularly interesting because I know people are usually surprised when I say that I have been put on the pill to help with my migraines. Whilst I was out of work last year, my migraines formed a definite pattern of only happening at menstruation and ovulation so I was put on a low oestrogen pill which I tricycle, which means I take three packets back-to-back before having the one week break. I was told this was to level out my oestrogen levels so that I wouldn't have the peaks and troughs of oestrogen which seemed to be the main cause for my migraines at that time. If I had migraine with aura then I never would have had this recommended to me due to the increased risk of stroke but since I don't have aura then I've been perfectly happy with this as a preventative treatment. I was very surprised therefore, to not read about this anywhere in this chapter and I wonder if this is a treatment they have started to recommend since the book was written about seven years ago.The charts which were shown in this chapter are very similar to the charts I was given by York hospital to fill in but those also included what times headaches started and stopped etc, as well which was useful for conveying when a triptan had seemed to work but then it returned the next day. The section I anticipated finding the most useful was within chapter fifteen and was about pregnancy. As someone who is wanting to get pregnant but can't start trying because of her migraines this was of particular interest. Most of the information here was about getting migraines whilst pregnant, to which the same answer was given time and again of only use paracetamol, something which I know doesn't come close to touching my migraines so that does fill me with dread. Eventually the issue I wanted addressing came up, about trying to get pregnant when you are on preventatives. The answer was what I feared it would be though, that you need to come off the preventatives before trying. I hadn't had such a definitive answer as this from the York hospital specialist nurse though so I wonder if it is less clear-cut than this but Dr Fontebasso didn't want to put that in writing. The book finished with a chapter about research which has become out of date quite quickly of course, so I'm surprised it was included. Seeing botox becoming a more widespread treatment on the NHS now though, I found it interesting to read the quite sceptical was Dr Fontebasso was talking about in 2006. The glossary at the end was very useful to anyone newly diagnosed who isn't used to reading the language used for migraines but the contact details section was again, out of date already with mentions of sending stamped addressed enveloped to some places. Overall, I think the book had quite a but of useful information in it but it was so difficult to find that information and even harder to then go back and reference it again, that I think the book ended up losing most of its value because of this. I won't be recommending this to any other sufferers I know and I didn't even find that it was wholly consistent with my experience as a patient of Dr Fontebasso. Thank you Daisy for such an honest and thoughtful review! One of us has been given some mis-information about getting pregnant. I've been told I can take dihdrocodeine for an attack - certainly stronger than paracetamol - and that I can stay on my preventative meds which for me is amitryptyline. Only take preventatives for a year?! They can pry mine out of my cold dead hands.